..... for the color challenge at the My Favorite Things Card Challenges blog. Just playing again today. What I started out to make didn't work out, but I did make a shaker card, using items from lots of different companies. The thing I learned today was that Ranger Archival black ink will dry and not smear on transparency with minimal wait-time. And it cleans off the stamp easily! Thanks for stopping by - hope you have a great weekend! 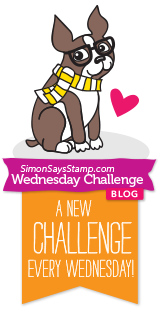 It's the end of the month, and that means an Anything Goes Challenge at the Simon Says Stamp Wednesday Challenge! 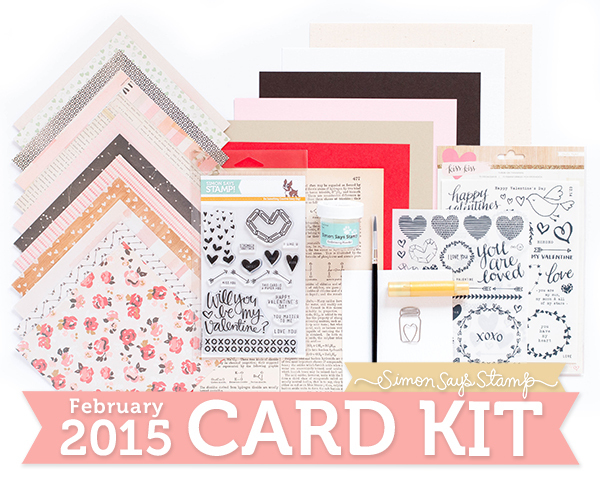 My teamies and I are using Clearly Besotted or Lil Inker products for our cards this week. If you have any of their products, please let us see your work with them! Now it's your turn! We have a $50.00 gift voucher to the Simon Says Stamp Store for a random winner of our challenge! Here's a card for the current challenge at the Simon Flickr group, a love theme. 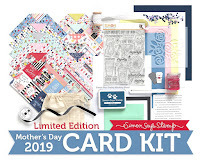 I used all Doodlebug design papers, Simon's Heart Parade, Sending, and Holiday Shapes (tiny white heart) dies, and the tiny sentiment from their Sending & Wishing stamp set, embossed in white. 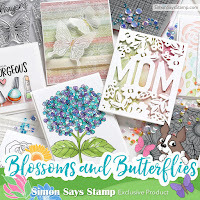 There will be 2 random winners of a $25.00 gift voucher to the Simon Says Stamp store! The challenge runs through 9:00 am Feb. 5. I hope to see many of you playing there! Just playing today. I had colored these pretty flowers from Paper Smooches Blossoming Buds with colored pencils back in the fall and never used them, so I "filed" them in the back of that stamp set. When I was looking through my stamps, I found them again and built my card around them. I fussy-cut them out, then popped them above my card base, along with an Impression Obsession scalloped frame. The sentiment is an old favorite from Technique Tuesday, Simply You. There was a bit too much white space for me, so I added some Lawn Fawn and Pretty Pink Posh sequins. 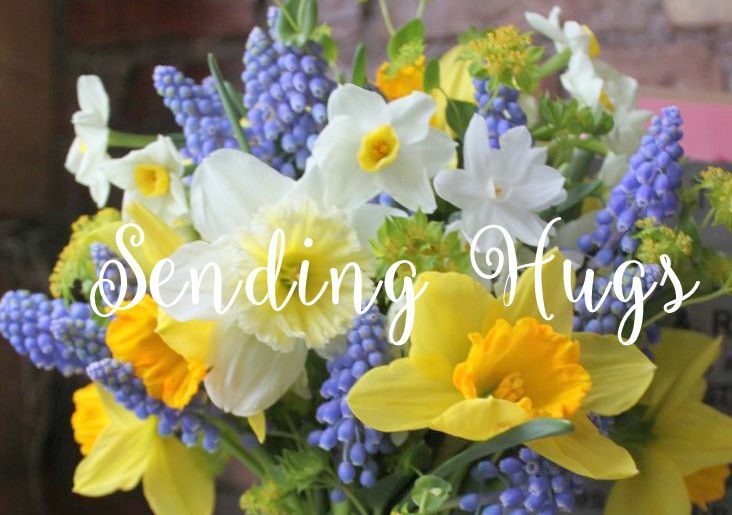 This is for all who are suffering through the snow and cold - have faith, spring is on the way! 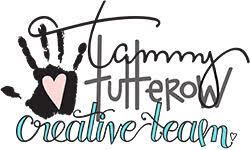 Here's a card for the sketch challenge at the MFT Challenge & Inspiration Blog. I followed it fairly closely, except for the scallop at the bottom; with the size of the wreath that I used and the corresponding strip, it just didn't seem to work for my card. I'm going to use this as a birthday card for a birthday coming up later this week. 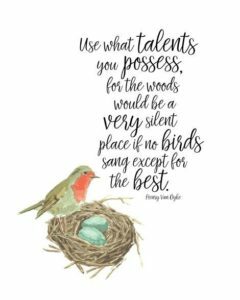 I've finally got my act together here and can play in some of the new My Favorite Things challenges. I was unsure about these colors until I actually tried them out for myself, and now - WOW, they are gorgeous together! I used an old favorite Technique Tuesday stamp called Two Steppin, stamped in Hero Arts Navy and Simon's Hydrangea and Green Apple inks. My sentiment is from Wplus9's Hand Lettered Hello, and the line of dots is from a Simon set called Thinking of You. I added some Lawn Fawn green sequins to the centers of the flowers. Though there are more multi-step stamps out there now, I can't think of many that are this size. I hope that someone brings out some bigger designs soon, as they are really fun to work with. Like I said, I love these colors together! Give them a try, and I think you'll love them too! Thanks for stopping by! I don't think I ever inked up this robin, so I'm so glad that Leni enabled me! Welcome! 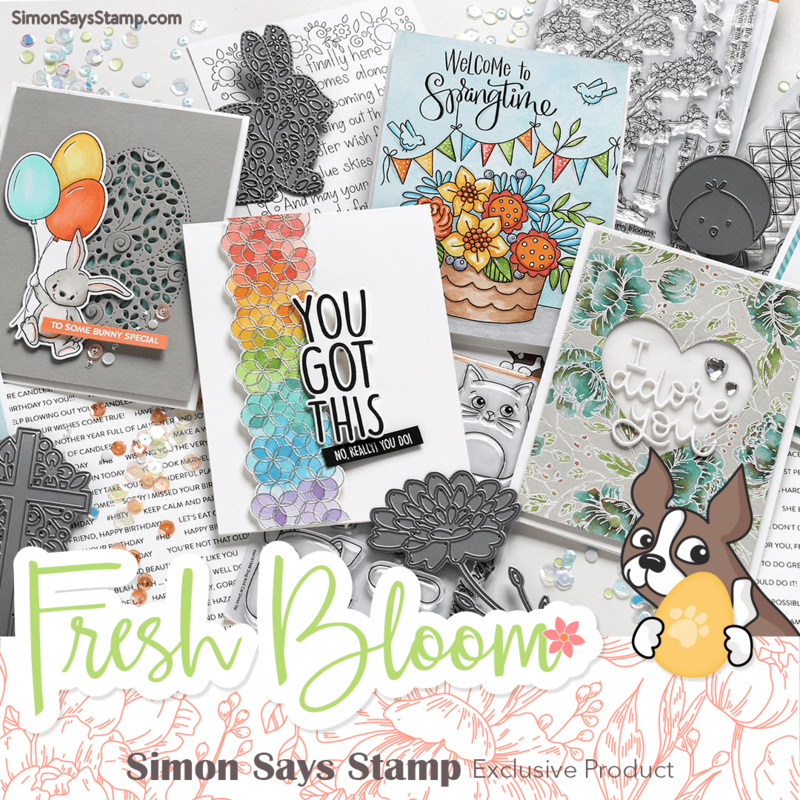 It's Wednesday, which means another challenge at the Simon Says Stamp Wednesday Challenge Blog! This week our theme is Have a Heart - can't wait to see what you make with this theme in mind - I LOVE anything heart-related! The DT are using Wink of Stella and/or Glitter Ritz products this week. I made you two cards, one using stamps, and the other featuring some dies; I coated all the flowers on both cards with a Wink of Stella Clear Glitter marker. 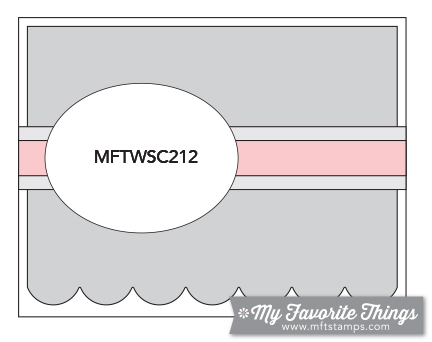 I chose this sweet stamp because the petals are made up of little hearts - right up my alley! And I chose the die below for the same reason. Now it's your turn! 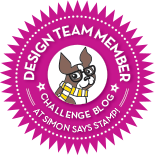 We have a $50.00 gift voucher to the wonderful Simon Says Stamp Store for one random winner of our challenge. I always enjoy stamping these Quilt Prints - it's almost as fun as making a real quilt and WAY faster! Here's another card, this time using the stamps from the February Card Kit from Simon Says Stamp. This is a really fast and simple card to make. I just changed up the ink colors on the falling hearts stamp, and then used one of the inks to color in the heart on the sentiment. Here's a card I made using materials in the new February Simon Says Stamp Card Kit. 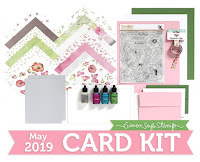 There are lots of fun goodies in this kit - Tim Holtz Watercolor paper and a paint brush, a gold Gelato stick, and a piece of antique dictionary paper! And I haven't even touched the stamps yet! And one more card for Winnie & Walter's First Birthday Bash. Julie asked for shaker cards, so I made a Valentine's Day one. Here's one more card to help celebrate Winnie & Walter's first birthday. Vanessa has a Gradient Challenge, and here's my entry for that one. Stencils and distress inks are a marriage made in heaven! I'd forgotten how much fun they are to play with! Simon Says..........It's a Guy Thing! Now it's your turn! We have a $50.00 gift voucher for the random winner of this week's challenge, to be used at our amazing Simon Says Stamp Store! Another card for Winnie & Walter's Birthday Bash Celebration, ongoing all this month. Joni gave us a pretty sketch, and here's my take on it. I love these fresh colors, and with all the white space, I'm going to enter this also into Virginia's View current challenge : Clean Slate. Most of my Winnie & Walter stamps are the sentiment ones with the big words, and I have very few that have other motifs, so I'm using the other flower from their Big, Bold, and the Extras set, along with the big happy from the Big, the Bold and the Happy stamped and fussy-cut. I still love my washi tapes, so a selection of those came into play, in pink, green, and grey, and I also added a partial doily die-cut and some pink sequins to the mix. As always, thanks for visiting today! Yesterday I participated in the 100th Hero Arts Flickr Scramble! Our hostess Barb asked us to choose our all-time favorite Hero Arts image and pair it with our all-time favorite sentiment set. These scrambles have been going on now for just about 5 years, and I've played in many of them, so I absolutely wanted to join this time, too. I used the Hydrangea woodblock stamp, from 2010, and a sentiment from the 2011 sentiment set Sending Smiles Messages - love the beautiful script font! And I used my favorite color, blue, to round out the favorite theme. I credit Hero Arts and their flickr group to fostering my love of stamping and card making, so today's event was very special for me. Thanks for stopping by today - I hope your weekend is going well! I stamped my flowers and leaves and heat embossed them in white, then overstamped them in various blue/aqua and green inks. I love a combination of stripes and florals! It's been a year since Winnie & Walter appeared on the scene, and they are celebrating big time this month with lots and lots of challenges! I am hoping to enter lots of them, but this is my first. Shay challenged us to use the number ONE and she gave us lots of ideas on how to do that. I chose to use one Winnie & Walter stamp set, You've Got Love Mail, and only that set, to make a card. I chose several of the sentiments from the set and stamped them diagonally across my card, creating a panel of text. Then I added some zig-zag stitching, using one of DieNamics Blueprints 20's dies, and lined it on the back of the panel with some strips of pink cardstock. I stamped the script heart from the set in 2 different pink inks, and to finish added some pink sequins. My panel was then attached to a white card base with adhesive pop dots. Happy New Year! 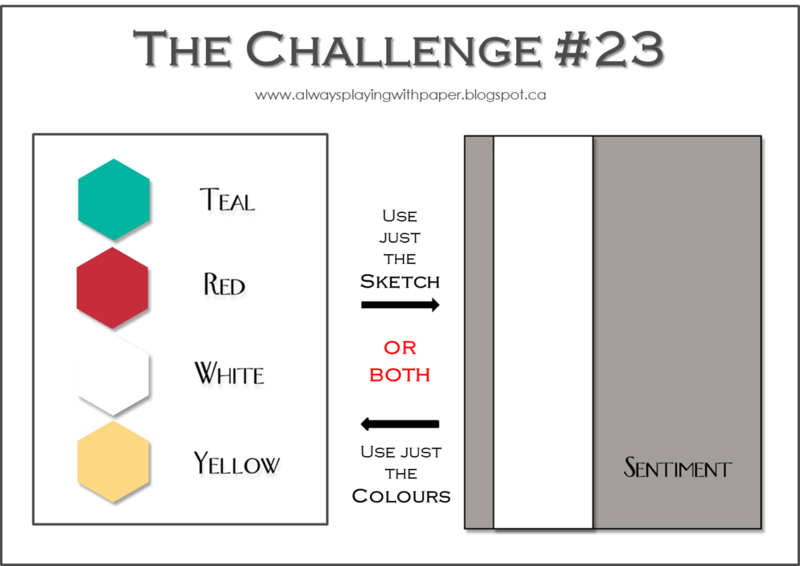 And it's a new challenge at the Simon Says Stamp Wednesday Challenge blog! 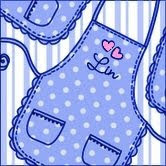 This week our theme is Something New ....... new baby, new home, new crafty item, you get the picture! 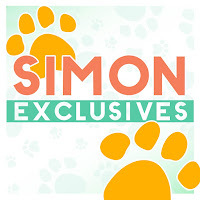 The Design Team are using Simon exclusive products this week. I'm using some new Simon stamp sets for my cards this week. I made a stamp-heavy, layered card and a CAS one. supplies: Simon's Lots of Snowflakes, Hand Lettered Winter Wishes, and Island Blue cardstock (for framing panels), also teal glitter cardstock and the largest of Wplus9's Snowflake Trio dies, silver sequins. I had planned to make this card using the new Simon Stitched Rectangles dies, but I keep missing them as they come into stock and sell back out again! They would have made making this card so much easier......but I was determined, so I did it the hard way. I started with 1 panel of white cardstock and stamped everything you see on it then took my paper trimmer and cut out the inner rectangle, and then a secondary one from what was left. Each panel was framed with Island Blue cardstock, and then put back together, lifting each one above the other with adhesive squares. My second card uses the same snowflake theme, but was so much easier to make, using a panel of negative snowflake die-cuts. Now it's your turn! As always, Heidi has provided another $50.00 gift voucher for the random winner of our challenge, to be used at the fabulous Simon Says Stamp Store!